Bryan Tolentino joins the Hawai’i Island ‘Ukulele Retreat! 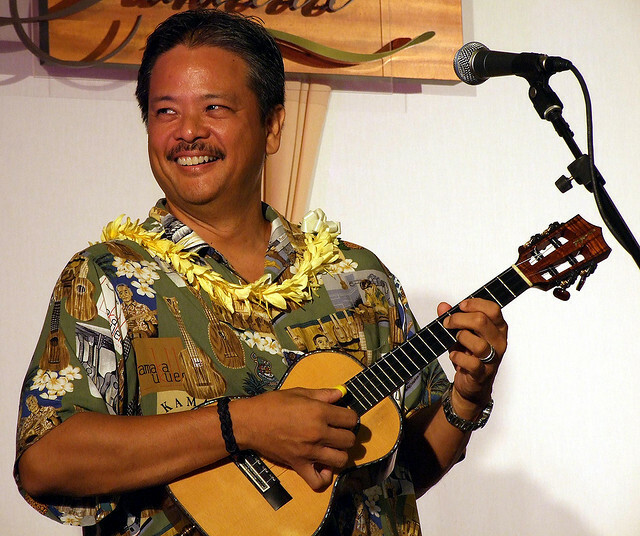 Bryan Tolentino is one of the most beloved and respected ‘ukulele players in Hawai’i today and we are thrilled to have him join us at Kalani for this, our inaugural year. A self-taught musician and ‘ukulele players, he has been playing ‘ukulele since he was 10 years old. (We’ll let you guess how many years that is!) Today he plays a mixture of Hawaiian, contemporary, and original songs, seamlessly blending creativity, diversity, and skill. But more importantly, Bryan is a highly regarded ‘ukulele instructor who gives his students the concepts and ideas that allow them to think (and play) for themselves. Rather than simply teaching a tune or two, Bryan teaches his students a variety of Hawaiian vamps, intros, outros, strums, and picking techniques that will help them own the music they play, regardless of the genre. Few things distinguish Hawaiian ‘ukulele music quite as much as the Hawaiian vamp: three chords (generally) strummed or picked at the beginning and end of a song and between many of the verses. And you couldn’t ask for a better guide than Bryan Tolentino to take you on a tour of the Hawaiian Vamp, explaining its purpose, exploring it in several keys, and learning to strum and/or pick your way through them. As in many things, Hawaiians have taken something introduced by foreigners, modified them, and made them their own. In this case we’re talking about Hawaiian strumming patterns, which, like the Hawaiian vamp or turn-around, is one of those things that will give your standard chord sequence that distinctly Hawaiian sound. And the best way to ingrain these into your muscle memory is to practice them over and over. In this workshop not only will Bryan Tolentino teach you a few Hawaiian strums, he’ll teach you few Hawaiian songs to practice them with. With what you’ve learned already, Bryan Tolentino will help you put it all together to become a proficient player, particularly in the genre of Hawaiian music. In this, the last in the series of Bryan’s workshops geared towards intermediate players, he will help you fill in any gaps and send you on your way with new skills to practice and tunes to enjoy. You paid for all those frets! Now is the time to use them. Even if you have already taken some tiny steps into the nether reaches of your fret board (that would be the fifth fret and beyond), chances are you haven’t plunged in head first. Given that, Bryan will help you make the leap by teaching you different chord inversions up and down the neck of your ‘ukulele and, just as important, showing you how and when to use them for the best results. Making music with your friends…….it’s one of the most fun, and gratifying ways, to spend your time. The trick is to make it as gratifying for the folks you’re playing with and for the folks who are listening as it is for you, In this workshop Bryan Tolentino will share with you some of the secrets that have made him one of the most sought-after ukulele players in Hawai’i. ~ by UkuleleLady on October 7, 2013.